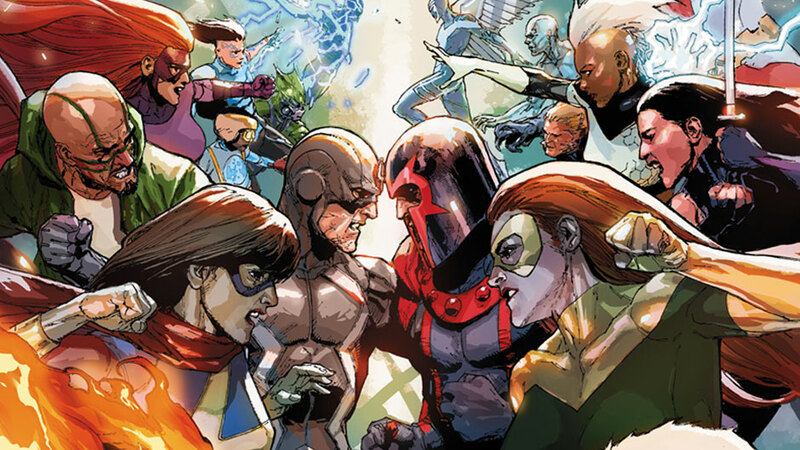 Marvel’s late 2016 and 2017 event-sized battle royale between the Inhumans and the X-Men has roots all the way back in 2013’s Infinity event from writer Jonathan Hickman. The impact of Infinity and its impact on the world of mutants didn’t become clear until after 2015’s Secret Wars, though, as All-New All-Different Marvel comics made it clear the Inhumans Terrigensis clouds roaming the globe were toxic to mutants. Although these transformative clouds were turning latent Inhumans into powered beings – Ms. Marvel likely the most notable among them – they were also building to a genocidal conflict between two of Marvel’s groups of heroes. Since Inhumans vs. X-Men has been so rooted in Marvel continuity for a number of years, I include much of the build-up that will prepare you for the event below, and then follow with the actual event tie-ins and crossover issues. Inhumans vs. X-Men Prologue: How Did We Get Here? The backup Medussa and Black Bolt story is a clear epilogue to the events of Inhumans vs. X-Men. Uncanny Inhumans #18 – #20 and Deadpool & the Mercs for Money #7 – #8 are also announced as a part of the event. Yep, they will be added as they are published. Thanks!